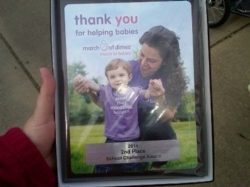 Update: NHMS collected a total of $1,981 for the March of Dimes Campaign! We won the 2nd Place School Challenge Award for Chesterfield & Marlboro Counties. Thank you to everyone who contributed! Ms. Byers' homeroom won the pizza party! October 28; 3:45 - 6:00pm; Teachers will review and explain test scores for MAP, PASS. We look forward to seeing you! Monday, October 20th 3:30 - 5:30pm; Band Room; Parents may park behind school. Director Geoff Mack (843) 337-9190 or gmack@chesterfieldschools.org. On October 16, the Central Eagles Marching Band and Color Guard performed for the 6th graders in the gym as part of their annual recruiting program. Band Director, Geoff Mack explained the different types of instruments and the process for joining the band. Open to 6th, 7th and 8th grade girls. Entry fee $30. Sign up sheet outside Ms. Mangum's door. On October 16, NHMS recognized Dr. Smith, Mrs. Lowery and Ms. McBride. Mr. Wallace Funderburk, Jr., President of Wallace Mechanical Supply, Inc. recently donated pencils and belts to NHMS. We very much appreciate the support of businesses to help us provide supplies for our students. NO football practice on Monday. Practice on Tuesday and Wednesday until 6:15pm. Sept. 29 at 8:20am, a Jostens representative will meet with 8th grade students to collect Spirit Ring orders. $40 deposit is required when placing order on Sept. 29. Testing scheduled for October 15. Cost $14. Please see our Guidance Counselor, Mrs. Rhonda Wallace to register for the test.